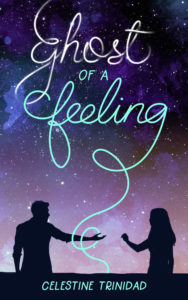 With mentions of failure, bullying and suicide (not to mention, a great pretender~) on the blurb, readers might think twice adding Ghost of a Feeling to their reading list. I know I did. Because if you’ve experienced these things yourself, it’s a little scary to be going into a story that could possibly mess with your head big-time. This book did get to my head—and to my heart. Cris is someone I feel for. Having failed at many things so many times before (and in the future, too), it is easy to understand her despair and confusion. Especially when situated in a society like ours here in the Philippines, where failure, of interpretations of it, remains a harrowing experience—looked down, shunned, gossiped about, pitied. Sometimes even, family, friends and other people who matter become the very ones that make someone vulnerable and insecure, like Cris, shrivel more. In turn, strangers can be a godsend. And for Cris, this is Nathan, in the form of their building ghost Emilio, who talks her out of putting an end to her life. While I had my qualms about his pretension at first (plus the fact that he was getting over someone), he proved me wrong. It turned out he has genuine intentions befriending (and eventually, romancing~) Cris. And with all his efforts, investment and that sense of humor, rooting for the #mumuLI was inevitable. Their moments together are also so heart-warming, casual conversations or philosophical exchanges. He may not have guaranteed happiness, but he sure brought it, anyway, along with hope. On bullying in the workplace, I’m [mixed feelings] to have found facets of my experiences in Cris’s, with her relationship with a senior at the hospital. I’ve been on both sides of this terrible behavior that happens everywhere and to anybody, and I think I can say how much this plays a huge impact on a person’s mental and emotional health. The author portrays this quite accurately, leaving me, as I’ve said, [mixed feelings]. Last but the most special: attempts of suicide, coupled with mental health. For those who deal with anxiety and the fear of dying like me, to come across a book like this is difficult. I don’t want to go on and try to discuss in-depth about something I myself don’t fully understand yet, but as far as the story goes, the author treats these themes with so much care. The reviewer signed up for an ARC through the author. The digital edition is now available on Amazon.